Here’s another way to decorate naturally for the holidays from Midwest Living. This woodland vignette is a perfect way to bring the outside indoors. Bare branches from the garden can be arranged in a glass vase. Fill the vase with artificial snow (purchased at Michael’s Craft Store). Wire on bright berries and add more “snow” to the branches. Add cardinals or any other brightly colored winter-friendly bird. Pine cones or a nearby nest can add an extra notion of nature. 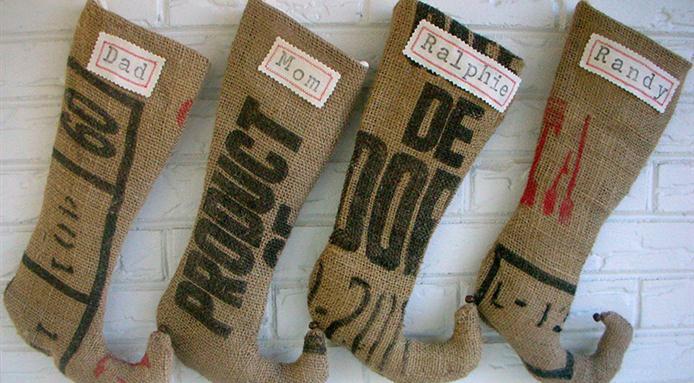 In keeping with the eco-friendly holiday spirit we just had to share these burlap stockings. Burlap has been making a very strong impression this holiday season. We’ve seen this wonderfully versatile and inexpensive material used to wrap gifts, make garland, embedded in wreaths, and to create the eco-cool stockings pictured here. Burlap’s neutral color establishes a versatile back-drop for any color scheme. Because of its highly textural nature burlap also adds a tactile dimension to any holiday décor. Regardless of your design point of view─rustic, modern cottage, or holiday chic, burlap is an affordable (and sometimes overlooked) material that’s arrived just in time for your holiday DIY project. What could be more natural than a twig, stick or branch? Though plentiful at garden centers this time of year, remember that some of the most chic alternatives to traditional evergreen could be lurking in your own back yard. Tree elements work in all seasons; but to us─they seem more apropos during the winter months when trees are naturally bare. Though Thanksgiving is only a few days behind we’ve already seen some amazing holiday tree techniques: birch branch icicle trees nestled with winterberries, banisters decked with redtwig dogwood, and cardinals perched on “snow” tufted branches hung with white twine from exposed rafters. One of our favorite ideas is this photo display featured in Midwest Living in which photographs are inserted into branches tied with twine. Bold colored berries provide a burst of color against the quietly toned pictures. We love the sparse metaphorical beauty of barren tree elements like these. Their stark elegance is a quiet reminder of another season’s passage─casting its final outline on the drifting snow of the departing year. Keep it classy. Though tempting─’tis not the time of the year to erect an 8’ inflatable Frosty the Snowman in the yard (sorry Frosty). Avoid anything overdone or garish; for example, choose simple swatches of mistletoe over those thick strands of neon blue garland. Keep the mantel clear. In general, the mantel should uncluttered and de-personalized. Remove any family holiday photos and greeting cards. You want your buyers to visualize their own stockings hanging from the fireplace mantel so refrain from hanging stockings adorned with family and pet names. Keep it non-denominational. Avoid anything overtly religious. Showing your religious preference can be a real turn off to potential buyers. Buyers can be quickly swayed (oftentimes subconsciously) in either positive or negative direction. Keep it de-personalized. Like the fireplace mantel keep the rest of the decorating similarly anonymous. Resist the urge of displaying those Christmas Carol figurines that your family has been collecting for generations. Such things can be very distracting. You want to keep the buyer focused on the positive qualities of the house─not on Maw Maw’s collection of holiday plates. Keep the lighting simple. When it comes to lighting it’s especially important to keep it simple. Neutrality is key. Lights can be very distracting─especially colored ones. A simple string of white lights positioned just so to highlight your home’s architectural features is ample. Keep it to a minimum. Avoid the tendency to over-decorate. A sash here and there is plenty. It’s very important to edit every decorating decision when staging for the holidays. Ask yourself, “Could this decorating choice possibly distract from the inherent quality of my home?” If the answer is “yes”─just put down the glue gun. Keep it fresh. Science tells us that humans respond positively to anything sensory and earth-centric. A stove pot of simmering cinnamon sticks or a bowl of pine cones centered on the kitchen table are the discreet touches that can tap into the buyer’s visceral tendencies. Creating this warm and inviting holiday feeling will last long after the potential buyers leave the premises. After all, effecting the buyers with a positive and lingering impression is the first step toward the ultimate goal of selling your home. We have to thank the numerous home renovation shows for exposing TV watchers to the benefits of wide open spaces. “We really want an open floorplan,” the couple says in hand-holding unison. Well, we happen to agree. We love making 100% of our spaces usable. A great example is our most recent build-out pictured here. Notice how everyone, anywhere, in this open-plan room can still be part of the same conversation. Many of the homes we renovate have original and wonderful “bones.” They may also have an abundance of rooms, hallways, and doorways that make the space feel choppy and disconnected. In order to transform the home into a more suitable place for living we need to open up the layout while keeping the old bones intact. Even more traditional designs are leaning toward a “modern” layout in which one or more large rooms function as a shared space. An open concept floorplan reduces the number of tiny rooms and wasted spaces. Typically the kitchen opens up to a den and dining area. The combination of these now fused “rooms” creates a more usable, sentient space. The uninterrupted lines of sight are a bonus for both family and entertaining. Dad can keep an eye on the grandkids or watch the game while chopping up veggies for dinner. Guests can gather in the main space while others flow with ease from area to area in and out of conversations. Over all the shared space provides more connectedness and fluidity. Suddenly the home feels larger. Removing walls and halls also unblocks natural light from previously eclipsed windows and makes even smallish homes feel more gracious. Also opening up vaulted and specialty ceilings can make the space look and feel more expansive. Adding a window or two will allow even a greater flow of natural light. Using natural sunlight in design always creates a wonderful effect throughout the interior by augment interior colors and bathing the space in nature’s healthy glow. Open floor plans are a uniting force─connecting the spaces and the lives of the people living within them. Because of this-we’re confident that open floor plans are here to stay. We can’t help but notice the uptick in the use of pendant lighting in home renovation. We’ve actually had a penchant for pendants for many years. In terms of both form and function pendant lights are an iconic choice. Functionally speaking they’re the ultimate task-master offering multiple types of illumination (for chore, decorative, and general lighting). In terms of form they range widely from traditional and transitional to uber-modern and back again. Though pendant lights are typically placed over a kitchen island, dining room table or billiard table-we like utilizing pendant lighting in additional areas of the homes. A pendant fixture in the foyer, den, or stairwell can create warmth and beauty. The casting shadows create a dramatic play off the ceiling and walls. The example posted below is from one of our recently renovated homes in Winnona Park. 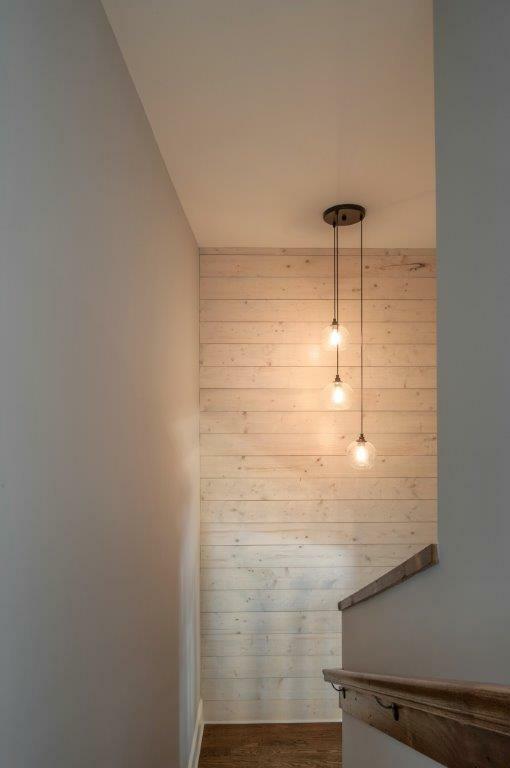 We love the way the light plays off the light, warm wood creating an incandescent glow. The light created the exact effect we were gunning for. The next photo is from the same renovation-this time the kitchen pendant lights lend a hint of elegance to the artisan functionality of this “Modern Farmhouse” kitchen. The re-purposed decking boards used in lieu of plywood keep the down-home-feel front and center. Next is a triptych of smoky glass pendant lights suspended over a granite kitchen island that creates a clean, symmetrical look embodying the aesthetically modern and elegant kitchen. The photo below illustrates the playful elegance of pendant lights hanging in the mint-colored children’s room. The lighting in the children’s room echoes the Moroccan undertones of the fixture hanging in the home’s foyer (final photo below). 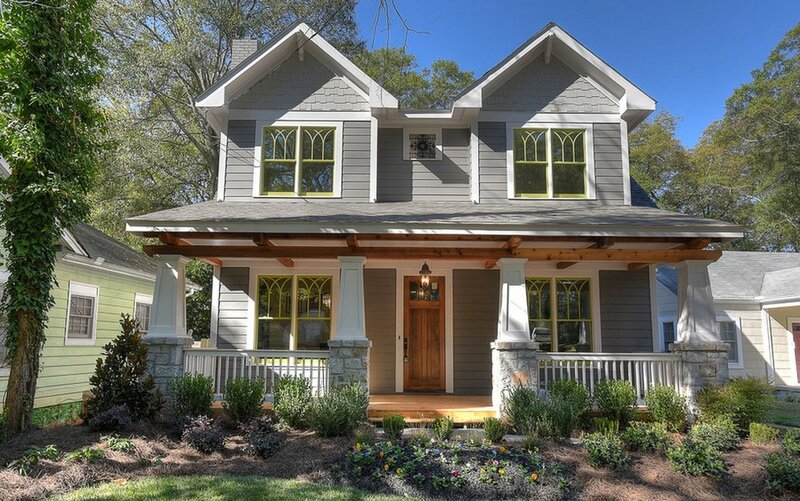 Gutted to the studs and built back by Level Craft in keeping with classic 1920’s bungalow charm—this one and a half story, 4 bedroom 4 bath bungalow is a real gem nestled in one Atlanta’s most livable, desirable neighborhoods. The modern elements provide a contemporary twist on a real classic. Shadow Stone Carrara marble on kitchen island is a sleek touch in the European-influenced kitchen featuring high end chef’s amenities. Wet bar with mitered laminated 3″ edge for extra beefy contemporary look. An über-modern 58” Sculptural George Kovac fan hangs in the foyer’s coffered ceiling. Deluxe screened in back porch with original rescued heart pine floors and breathtaking Midtown views is one of the many plusses of this home. The original fireplace is a true brick classic flanked by original built-in book shelves and newly crafted entertainment cabinet. Hidden pocket doors lead to cloistered office. Mobile custom closet compartments for storage convenience and adaptability. Abundant natural lighting along with additional sculptural, recessed, LED and halogen lighting. Overall ambient tone of open, airy, lightness. Red oak floors stained with rich ebony and contrasting dove white walls evoke thoughts of Italy in the heart of Midtown. This custom renovation is an ideal example of what we can do for you and your project. Please contact us on our contact page or directly 404.704.7350 to discuss your renovation idea. Henry Ford said “Experience is thing of supreme value.” We agree. An advantage of two decades of experience is a well-honed design instinct. Simply put—we trust our guts. Looking back at our work we can’t help but notice that whenever we put our heads together the result is always a seamless blend of a few favorite styles. Virginia grew up in Coastal South Carolina so it’s easy to trace her Low Country design sense in many of her architectural and design choices. The simplicity of Asian design has always appealed to me—the balance and reference to nature not only draws me in visually but also provides a compass for the direction in which I aspire to live my personal life. Above all we both love the form and functionality of Scandinavian design. This photo illustrates what we’re talking about. Even though this space might be considered somewhat deep in terms of footage we still managed to create an open Zen-like space. Of course fans are typical in Low Country dwellings. Here, the choice of dark wood is an Asian reference as are the simple natural branches in clear, simple vases. The rattan baskets are another coastal element as are the Asian-silhouetted whicker chairs. The throw pillow with Moroccan pattern is an easterly nod. The prioritization of functional separate spaces for sitting, dining, etc. is the overall essence of Scandinavian design. Having deciphered our Coastal-Asian-Scandinavian design sense immensely simplifies our process. More importantly, our clients are always pleased the results of our blended styles.